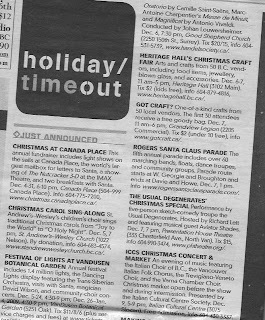 Check us out in the Holiday Time Out in this weeks' Georgia Straight. UPDATE: The yarn has been spoken for. Thanks!!! 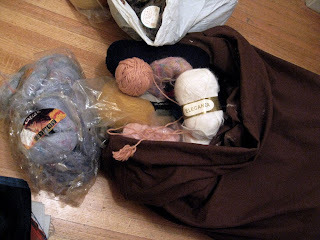 FREE bag stuffed to the brim of yarn. Lots and lots of yarn. Vintage yarn. This is from either my grandma's or eldest aunt's stash. There are price stickers on here from Eatons, Sears and Woodwards. If you want it, please send me an email. You need to be able to come by and pick it up though. The bag is quite heavy. I can't believe I haven't posted since Wednesday! 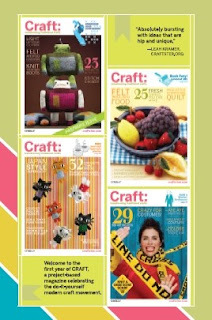 Craft magazines arrived in the mail!! Woot. 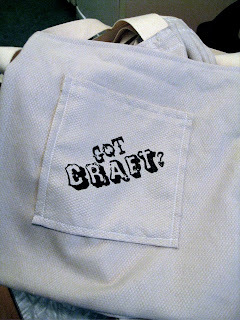 I was at the crafty get together hosted by the Craft Mafia last night. Thanks to Lili for the invite! Met lots of new faces and handed out a few posters and postcards. Lots of crafty events happening this weekend including One of a Kind, Eastside Cultural Crawl, Fallen for Etsy, Fab Fair and Maternal Creations. 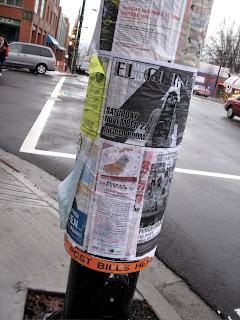 For a full events calendar, visit our Around Town section here. 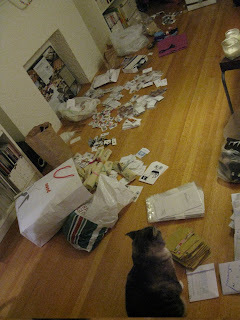 A friendly reminder that postcards and posters are available for pick up. If you are going to be at any of the above shows, please let me know and we can arrange for some to be dropped off. If you did not receive an emailable flyer, please let me know and I will send a copy to you. Are you on facebook? 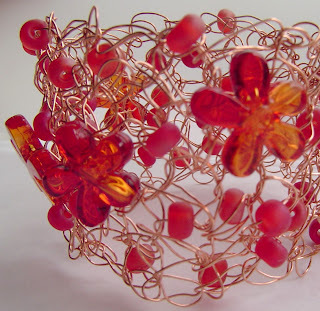 Join the Got Craft group and invite all of your friends!! Plenty of cool swag have been coming in through the last few weeks. Ever since the Fall / Winter hit, the light in my apartment has been a little on the dark side. I hope to post some pictures soon. 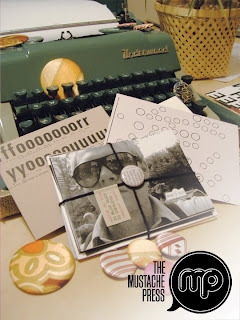 I love buttons and the Mustache Press is the perfect place for all of your button needs! 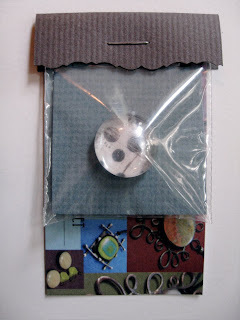 Last year, Lindsay and Nic donated 500 buttons to Got Craft and everybody loved them! They are back for another round of Got Craft and I am pleased to announce that they will also be at our new wedding show called Indie I Do on January 17th, 2009. If buttons are not your thing, the Mustache Press also has a great selection of original stationary and posters! 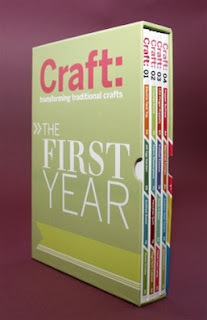 One lucky attendee will have the opportunity to walk away with a complete boxed set of Craft Magazine - The First Year. 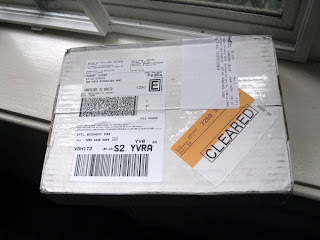 That's 4 magazines in a lovely gift box valued at $80.00! A BIG thank you to Craft Magazine! 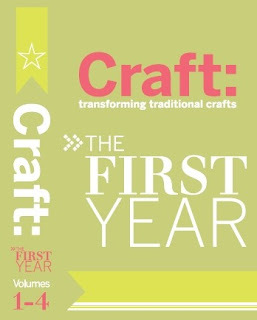 For more information about Craft Magazine or for a subscription, please visit their website and show your support! 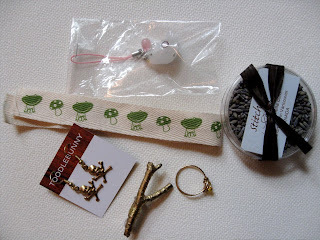 The holiday craft fair season has started. 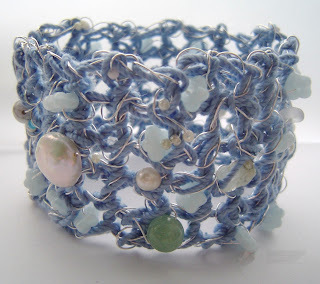 If you haven't already visited the Around Town section on the Got Craft website, then go grab your daytimer and click here. I signed up to participate in 3 fairs this year. Which is 2.5 times more than last year. However, I have not been crafting 2.5 times more than last year. Not to worry though, I have lots of new ideas and have already started making some old favourites. 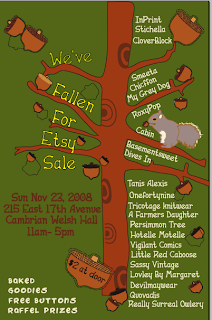 My first fair of the year is Fallen For Etsy on Sunday, November 23rd at the Welsh Hall. 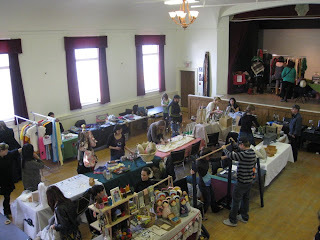 Other Got Craft vendors that will be there include Stitchella, Smeeta and Little Red Caboose. See you there! 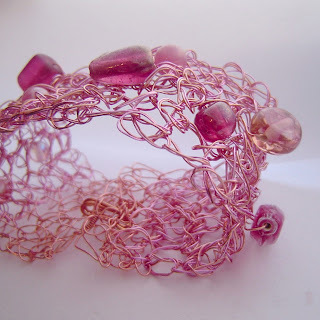 My plan in the coming weeks prior to Got Craft is to showcase some of the wonderful vendors that will be at the show. 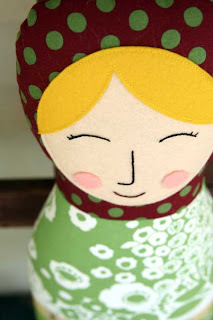 The beautiful Matryoshka Doll pictured above is made by Ella from the little red caboose. 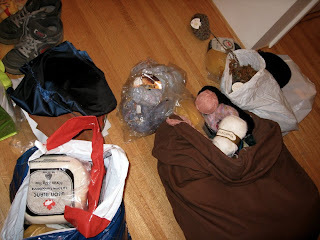 Each doll is handmade and stuffed with 100% lambs wool. You can visit her website here. Ella, along with her sister Leanne, is also an amazing photographer. 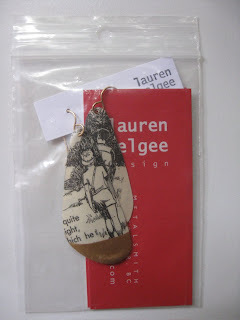 You can see some of her work on her blog. Little Red Caboose's felt crowns were just featured in Mothering Magazine and in the Canadian Family Toy Guide. 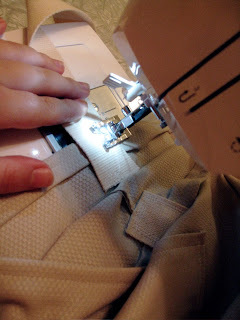 More information and images can be found on her blog. Jeannette from The Beautiful Project is featured in this weeks' Georgia Straight. 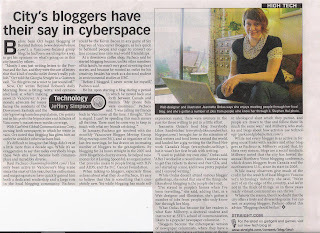 The article is called 'City's bloggers have their say in cyberspace' and you can read the online version here. 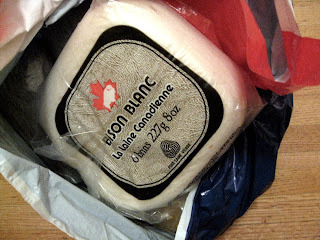 The Beautiful Project is one of our featured vendors in the December Got Craft show and Jeannette is also the mastermind behind one of my favourite blogs - everybody likes sandwiches. If you read the lotus events blog, then I'm sure you read about my rave reviews on her apple crumb cake... drool. 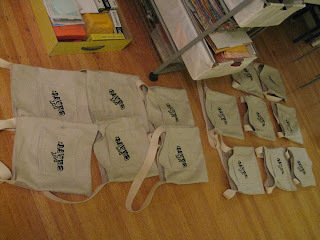 30 swag bags are almost complete. 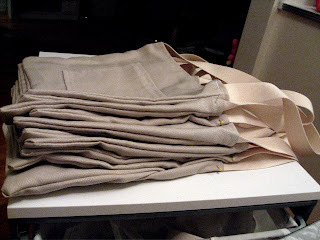 I have 15 more handles to sew on and then a gocco they will go! 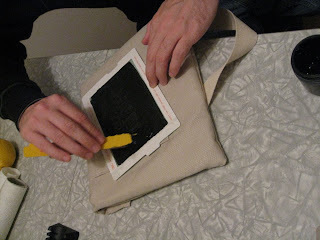 For our first two events, we used recycled paper bags and then we moved to handmade, reusable fabric bags. I have to admit, these bags are the best. Being a self taught, beginner sewer, the December bags look fantastic. 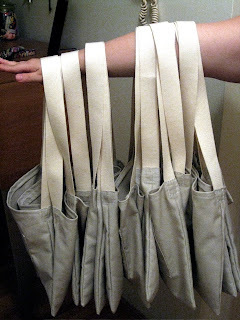 Plus these bags have a bonus.. a handy front pocket! If you are participating in this years' fair and you have some questions about the swag, information can be found on the second page of your application. 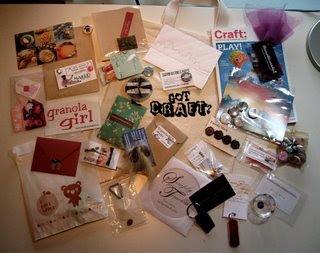 Also, there is a picture of a previous swag bag in one of the earlier posts from May. Need some ideas? Feel free to contact me.